Continuing on last week’s column, I have a new bug to talk about. 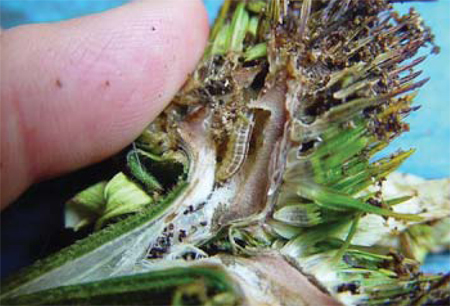 There’s a worm, or probably more correctly, larva, that’s burrowing into the cones of echinacea (cone flower). I first noticed that some of the cones were turning black, then had a customer from Oshawa tell me that she had run across this last year as well. I started inspecting my echinacea more closely, pulling apart the cones of the flowers that had turned black already. Deep down in the cone, far from eyesight, was this fat little worm about 1/2 inch long, greyish-green with stripes. He (I’m calling it a he because of its voracious appetite) did not like being exposed and starting squirming and trying to get as far from me as he could. I began removing all of the flowers that had blackened cones. It turned out to be a considerable number, almost half of them. I then started looking more closely at the remaining flowers and noticed that some of the paleae (the orange spikes that make up the cone of the single-flowering varieties) were standing taller than the rest. These orange spikes are what gave echinacea their name, which was derived from echinos, the greek word for hedgehog. I carefully pulled apart the cone and found another worm, this time a little smaller. After removing all of these flowers, I got in for a real personal and up-close look at the remaining flowers. In between the orange spikes I noticed a small grey mass. Certainly not something you’d see unless the cone was close enough to poke you in the eye. I pulled apart the cone and, sure enough, found another worm, this time no bigger than 1/8 inch. I removed all of these flowers and then took the stems down to the base, just in case they were also taking up residence in the stems. When I stood back and looked where there had been, just a short while beforehand, hundreds of blooms, there was now maybe a dozen. I filled two garbage bags with flowers and stems and tied them tight to keep the worms from escaping, which they started trying to do within an hour of the flowers being cut. I then tried to Google the problem but nothing showed up, so I changed the wording, but again nothing. I sent a few Emails to some plant people I know, but they didn’t know anything about it. They have since passed it on to people they know and I’m still waiting to hear back. A few days later I was doing a consultation at someone’s home when I noticed that all of their echinacea had black cones. I told them what I had found and asked them to cut all of their echinacea back and burn them. The next day, another consultation, and more worms. I then received a shipment of plants coming from the Hamilton area and immediately checked the echinacea. They looked fine, but between the orange spikes was the grey mass. I cut apart one of the flowers to reveal the worm and put it in a ziploc to send back to the grower (along with all of the echinacea). Two days later we had another delivery, this time from the Niagara region. Again, the echinacea were returned with a flower cut in half, safely secured in a ziploc. Having destroyed most of the flowers and stems, and checking the remaining echinacea daily, I thought we were on top of this new problem. Then I noticed that it was getting into the Heliopsis (false sunflowers) as well and I began checking all flowers with that daisy shape to them. I found it in some of the Rudbeckia (Black-eyed Susans) too. After updating everyone I had passed along the initial information to, I cut back more plants, had a little (ok, a lot) less colour, but hopefully no more of these worms. Please, check your Echinacea, Heliopsis, Rudbeckia, and Asters (when they start blooming). Cut them back fairly hard and burn what you cut right away. If you can’t burn it, seal them in a bag, preferably black like a garbage bag, and leave them in a sunny spot, which will hopefully cook them, until you can put them out with the garbage. Don’t compost them, or put them in your green bins. I’ll let you know when I have any more information. Hopefully, this isn’t a major concern like the lily beetle, and is just a problem this year because of the mild winter. Thank you for posting this info online. I too have been searching for information on the culprit with no luck until I stumbled across your page. We have had a few customers calling & coming in asking about this critter this past week, so now I know what to tell them! I too have sen this problem in my garden and others and even at the local nursery! I am hoping there is an ‘acceptable’ solution sooner rather than later. Hi 🙂 I live in Buffalo, N.Y. and had this problem last year. I also had to cut all my coneflowers and blackeyed susans down 😦 I asked the local nursery if they knew what these criters were and how to get rid of them, but had no luck. I’m hoping this year they won’t return. Please keep me posted on any info. You learn about these nasty little worms. I’m betting that with the mild Winter we had, that they will be back stronger this year. I’m still hopeful that a normal winter will reduce their numbers or kill them off completely. BTK is supposed to be effective but the timing has to be right. They use it for them on sunflower crops. I’m the owner of So Fond of Landscaping, my small gardening business in south central Ontario. I noticed this distortion last year and even found the larvae. I’ve been looking for an organic solution of eradication. I never thought of burning them. It’s what I do with Fall Web Worm and Eastern Tent Caterpillar, so why hadn’t I thought of it… I will educate my clients as to why I am cutting back all of there colour. I’m up in the Southern Adirondacks of NYS. For the past three years I have had catepillar/worms attacking the buds of my heliopsis, coneflower and any plant with that type of structure. The center of the bloom becomes black with “poop” and the petals get stuck together with it. It comes on in the middle of July. I have huge gardens and it’s hard to pick these critters off. This year they are even in the buds of my lavendar bee balm. Last couple of years, I have cut the plants down (heartbreaking) in the middle of the summer and hoped they would not come back, but they did, despite a very bad winter. What do I do to get rid of them? Neem oil? Soap? I have cats that are constantly in my garden and I can’t use anything toxic. Thanks for the reply. Although the aftermath of their “attack” very much resembles the picture you posted, after looking at photos on the internet and comparing markings, it’s possible these critters are inch worms. Do you know if inch worms attack and eat the center of buds, leaving “dirt” and a sticky residue that prevents the remaining petals from unfolding? So far what I’ve read says they only eat foliage.